Whether you're feeding 20 or 200, you can bet it's gonna taste better with Genesee Pub and BBQ. All it takes is a quick call to Genesee Pub and BBQ catering and we'll pack up everything for you and bring it to you wherever you are. 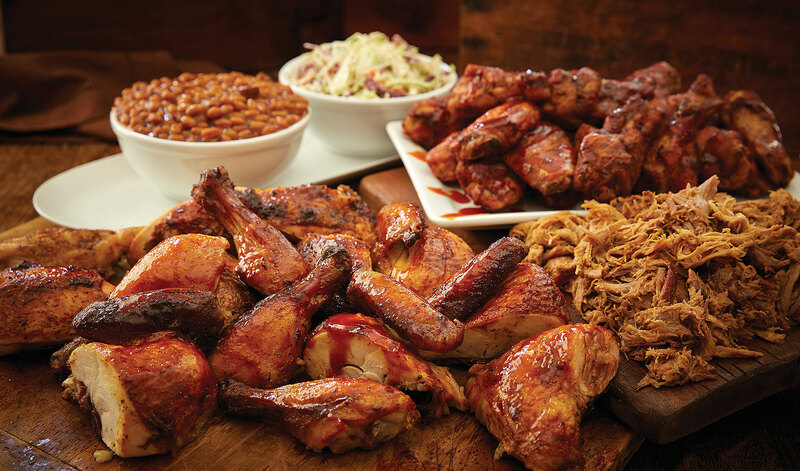 Mouth-waterin' slow smoked meats, sides – whatever and however much you want. We offer a great selection and our super friendly staff will even set it up for you! From drop off catering services to complete event management, we can provide buffet catering for twenty, a sit down dinner for a couple hundred or a themed cocktail party. To learn more about our services and view galleries of our work, click the link below. RENT OUR RESTAURANT OR PRIVATE ROOM FOR YOUR EVENT! Leave all the work to us and rent out the Genesee Pub and BBQ Restaurant or we have private meeting room space for corporate training or workshop type of events. This private room seats 75 people comfortably and can include everything you need for your meeting such as flip charts or overhead projector. We meet with our potential clients to discuss their personal tastes and budget to organize a fun, relaxed and delicious event. Orders must be called in at least 1 day in advance and paid in full when ordered. Pick up order, parties of ten or less. Pick up or we drop off, parties greater than 10. Cost of labor and supplies to be determined on the size of the catering event. Full service package comes with serving utensils, plates, silverware and napkins. We recommend 1/2 lb. of meat per person.